Preheat oven to 375 degrees. Cut bacon in half crosswise. In a large skillet, cook bacon over medium heat until partially cooked but not crisp. Remove to paper towels to drain. 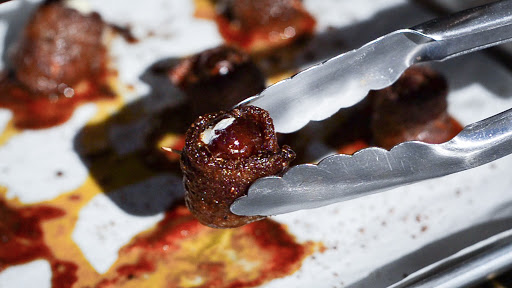 Cut a lengthwise slit down the center of each date: fill with 1/2 teaspoon of cream cheese. In a small bowl, mix brown sugar, chile blend powder and cinnamon. Dip one side of each bacon piece in brown sugar mixture; wrap each date with a bacon piece, sugar side out. Secure with a toothpick. Shake everything together in a small jar, cover and store in a cool, dark place for up to 6 months.